All around the world, the challenges and emotions of sending our children off to college are much the same. This insightful blog post came to me this week from a friend in London, J. John. I think it caught the essence of this changing relationship with children just right. I don’t often bring my family into what I write: I think they deserve some privacy. However, my wife Killy and I have recently undergone such a drastic change in our lives that I feel the need to write something! Our youngest son has gone to university and for the first time in nearly a quarter of a century, we are quite literally home alone. There are both good and not-so-good things about this. Suddenly the house is free from suspicious piles of washing and there is no loud music. The shower is never occupied for half an hour, the only magazines or CDs we are in danger of tripping over are our own and our food bills are halved. We can watch what we want on television and the house is quieter: the phrase ‘low-profile’ can never be applied to sons! But of course there are not-so-good things. Even in this age of being able to connect to almost everyone, everywhere, at any time, to see your children leave the home results in a feeling of being ‘disconnected’. There is a new remoteness. You find yourself frequently wondering, ‘What are they doing right now?’, ‘How are they feeling?’ ‘Is there some way we can help them?’ Indeed, at the deepest level, there is something that could rightly be described as a sense of loss. It’s hardly surprising. You have spent a quarter of a century with much of your life oriented around fulfilling the needs of your offspring and then, suddenly, they are gone in a cloud of suitcases and boxes, leaving silence behind. There is a finality, too, about children departing. When your sons or daughters are at home they are clearly your responsibility: however old they are, they remain ‘your children’. Once they leave they are on their own; they are still your sons or daughters, but they have to look after themselves. Childhood is ended. Can’t wait for the Christmas holidays for their return! Dr. Ligon Duncan preached the third of our chapel series dealing with the hard questions of faith. This week’s question: Does Christian hypocrisy disprove Christianity? It was a remarkable message – you can listen to it HERE. There is no sin that you are afraid to admit, that God is not more willing to forgive than you are to repent of. All the scoring records were broken Saturday by our Blazer football team. It was a great day of football for fans and for the players . . . we were up 70-14 with 4:45 left in the third quarter so lots of guys got a chance to play. We have an event coming soon to get on your calendar – and I’ll warn you now, if you miss it, you’ll be sorry you did because this will be the event of the fall everyone on campus will be talking about. Mark your calendar and bring your family, kids, grandkids, neighbors, and church group. 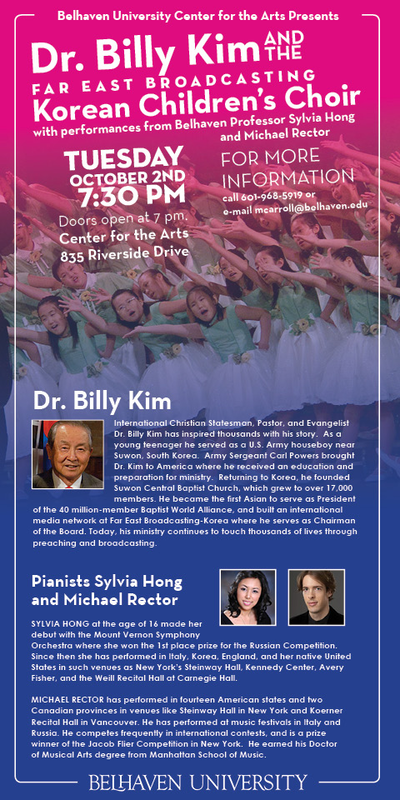 On Tuesday evening, October 2, Dr. Billy Kim and the Far East Broadcasting Children’s Korean Choir will be presenting a concert in our Center for the Arts at at 7:30 pm. This will be a spectacular event, and will be colorful, fun, and this remarkable children’s choir especially enjoys doing American patriotic music. The costumes alone are worth the price of admission – if we were charging. But it is FREE to all. The choir will be singing, Dr. Kim will be speaking, and we’ll have a special piano duet from Sylvia Hong of our faculty and her husband Michael Rector. The full evening will last about 90 minutes. Dr. Kim is one of the great statesmen of the Church, and the opportunity to hear him in person is something you’ll always treasure. Doors open at 7, and the concert will begin right at 7:30 – and you won’t want to miss the choir’s grand entrance, so be on time. The front page of the September 11th Clarion Ledger features Jay Levy — one of the students in our Master of Education program. The story chronicles the success of his school in increasing student scores on the English II test — a requirement for high school graduation. The story reports how Jay and his colleague, Emily Peters, have helped this rural school dramatically improve in just one year. Jay is in Dr. Cathy Wasson’s curriculum class tonight, while his story is being shown on the local NBC and CBS news programs tonight. Quite an accomplishment for a first-year teacher! From the front of his classroom, Pisgah High School English teacher Jay Levy began pointing to students for a response. Pearl. Florence. Northwest Rankin. Madison Central. “Beat them,” Levy said after each response. “Beat. Them,” Levy said, drawing laughs from the students. Pisgah High, Levy explained, had the highest percentage of students earning the highest scores on the state’s standardized English II test. On paper, that feat seems unlikely for the small, rural school in Rankin County, where approximately 54 percent of students qualify for free or reduced lunch. But recently released data from the state Department of Education shows that almost 89 percent of the Pisgah students who took the English II scored proficient or advanced, which is higher than not only the more affluent schools in Rankin County but also the rest of the state. Approximately 98 percent of Pisgah High students who took the English II test earlier this year passed. We have some great chapels all through the semester at 11am on Tuesday mornings. But this week was very special. The music was remarkable, the spirit of the students was energetic, and the message was the best I’ve ever heard in my nearly 40 years of attending college chapels. Dr. Ligon Duncan, pastor of First Presbyterian Church in Jackson, helped us wrestle with the hardest core question of faith with insight and eloquence that laid open why we must believe in God.